Back of Beyond Baking: Time to Parrtttaay! I developed my hatred of meringue when I was around 10 years old. My friend and I had a midnight feast of meringues and cream then I spent the next day being sick! I probably need to clarify that the meringues were little, hard, sickly sweet swirls and the cream was out of a tin! To say I hate meringue is also not quite true because I am partial to lemon meringue pie with the lovely gooey meringue topping. Then I thought about this blog, how I like trying something new and suddenly I found myself texting Sophie saying "for you I will make Pavlova!" I found Delia's full proof recipe for Pavlova which looks ridiculously easy and (after a discussion with my big sis who uses said recipe all the time) I set off on my mission to make a perfect Pavlova. With the help of my trusty Kenwood chef making it was simple but what wasn't quite as straightforward was finding a box big enough to protect it on the 140mile nerve wracking car journey to my friends house. And also, once it was filled with cream, strawberries and raspberries, the equally nerve wracking drive onwards to sophie's party! I am pleased to report that it arrived in one piece, I actually liked the meringue with it's soft marshmallow centre, and it was totally gluten and lacto free so Gemmy was able to partake of the creamy, squishy, berry encrusted triumph! When they're ready, start to whisk in the sugar, approximately 1 oz (25 g) at a time, whisking after each addition until all the sugar is in. Now take a metal tablespoon and spoon the meringue mixture on to the prepared baking sheet, forming a circle about 8 inches (20 cm) in diameter. Then spoon round blobs next to each other so that they join up to form a circle all around the edge. Now, using the tip of a skewer, make little swirls in the meringue all round the edge, lifting the skewer up sharply each time to leave tiny peaks. Now place the baking sheet in the oven, then immediately turn down the heat to gas mark 1, 275°F (140°C) and leave it to cook for 1 hour. Finally, turn the heat right off but leave the Pavlova inside the oven until it's completely cold. To serve, lift it from the baking sheet, peel off the paper and place it on a serving dish. Just before serving, whip the cream then fold in the defrosted raspberries until you get a nice rippled effect. 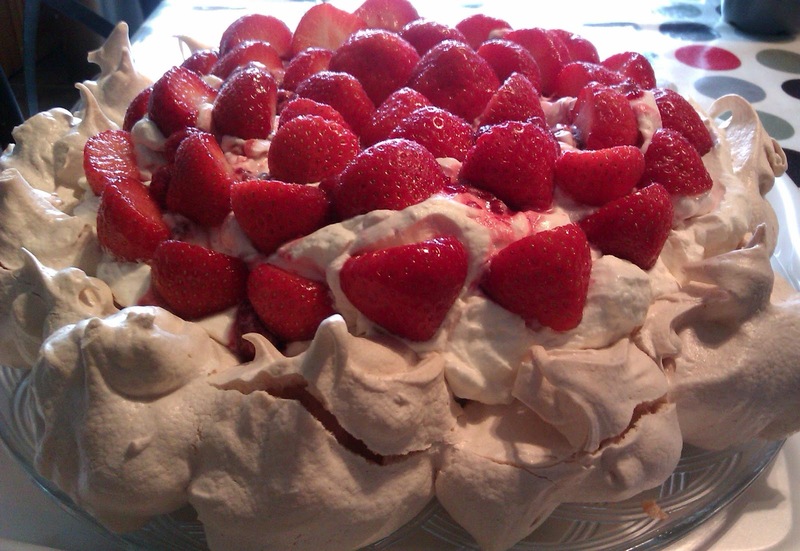 Spread the mixture over the meringue and arrange the strawberries over the cream.